Mrs. Kolbert’s Class Blog » Blog Archive » Track Santa Online – Don’t Miss This! Track Santa Online – Don’t Miss This! This is an email I sent to my students’ parents today. Feel free to copy it and share with your students. 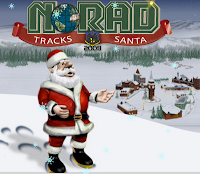 Every year on Dec. 24, NORAD (North American Aerospace Defense Command) opens up their special site so people can track Santa in real time. It’s not just a “Oh, there he is on the map” sort of thing. Once you see where Santa is on the map, you can see the sparkle trails of where he’s been already, and click on the video icons to see videos and explore more. There are Wikipedia articles and beautiful photos at almost every location. According to Google, almost 8 million people used the site last year. As of this writing, Santa is in Aparri, Philippines but in 3 minutes he will be in Zamboanga, Philippines. Too bad this wasn’t available when my boys were young. Thank you Mrs. Kolbert for this great web site. We followed Santa all the way to Boca, and he even stopped by to deliver our gifts. Hope you have a happy holidays, and Merry Christmas to all. oops i spelled some things wrong by accident! that is so awesome,cant wait to do it!!!!!!!!!!!!!!! !